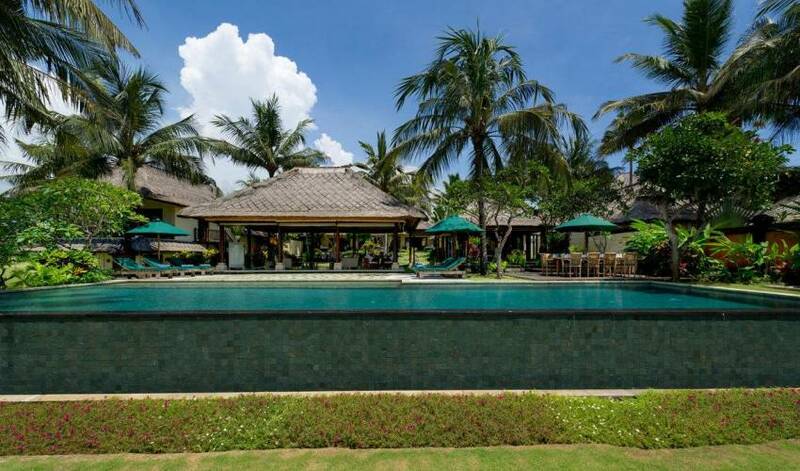 Villa Ombak Laut enjoys what is quite possibly one of the most spectacular locations in Bali. With uninterrupted ocean views across glistening black sands and a rocky outcrop baring a revered sea temple; rolling tropical gardens featuring two dazzling swimming pools, an immaculate tennis court; a romantic sunset balé; spacious, comfortable living and sleeping pavilions, and five-star service including an in-house chef – this six-bedroom villa will simply take your breath away. 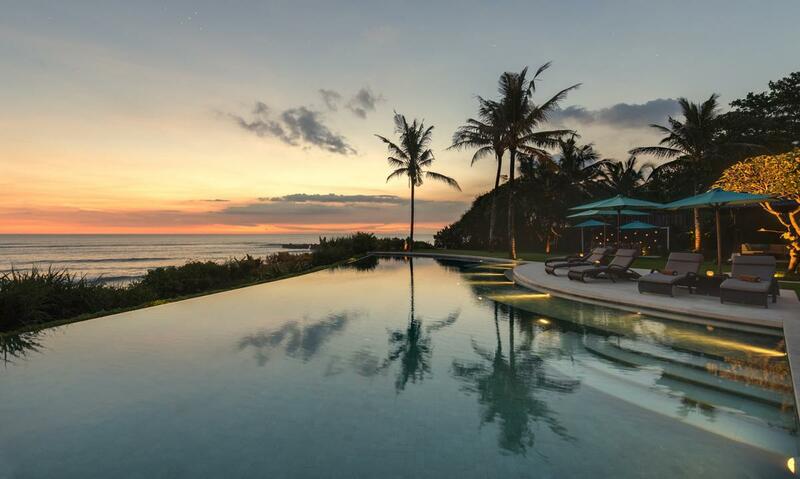 Poised above the beach near the delightful village of Cemagi on Bali’s south-west coast, this striking villa luxuriates over one hectare to create a private retreat perfect for families and groups seeking a peaceful and relaxing holiday. Blessed with incredible sunsets, views over neighbouring rice terraces, the hypnotic sounds of crashing waves and glimpses of traditional village life, the villa is indeed something special, and a place you will never forget. 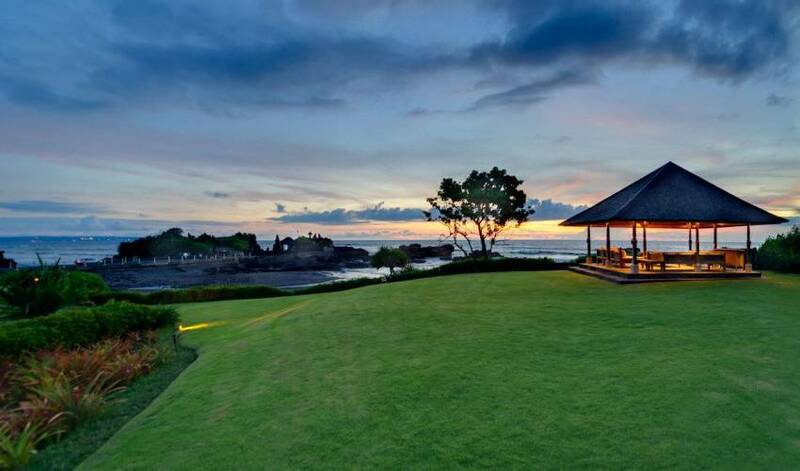 Ombak laut means ‘ocean wave’ which could not be a more fitting name for this six-bedroom seaside retreat. 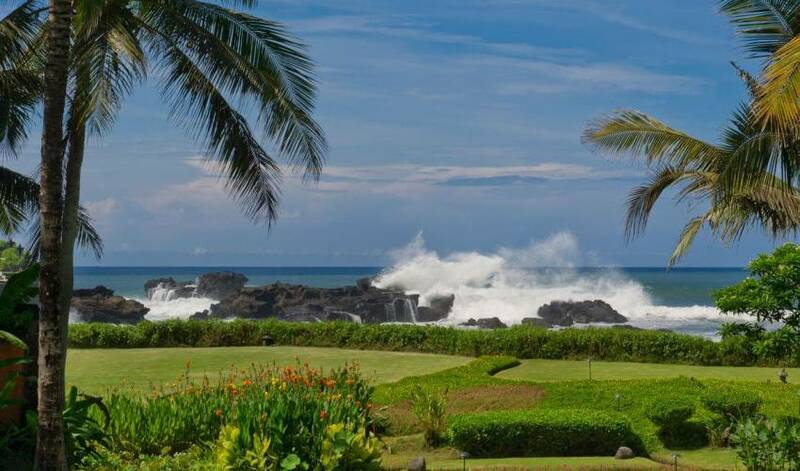 The villa boasts 100 metres of absolute beach frontage on Bali’s rugged south-west coast, and the roar of the ocean can be heard throughout the villa as waves crash against the black volcanic rocks and the spectacular sea temple that rises above them. Carefully designed to capture the sea breeze and the ocean views, the villa features individual living and sleeping pavilions with high-vaulted ceilings and alang-alang thatched roofs, fashioned on the traditional Balinese compound. An antique Javanese gladak (wooden house) forms the sixth bedroom adding to the Indonesian flair and charm that makes this villa so unique. 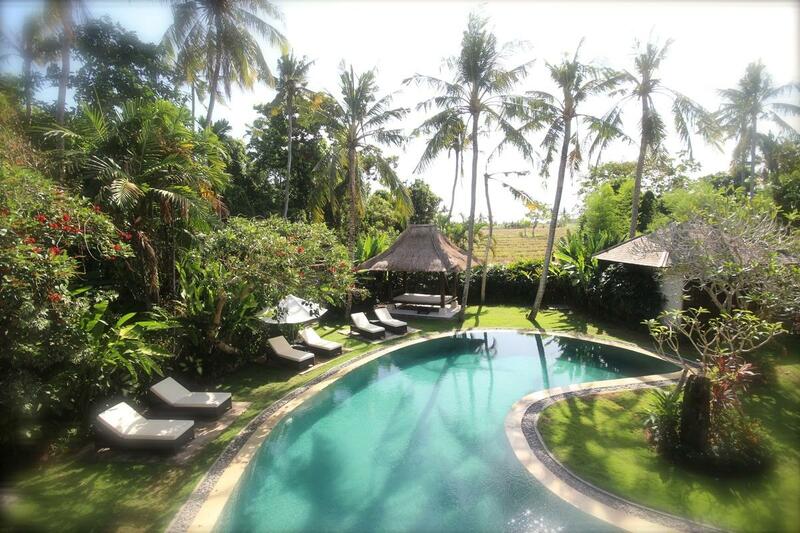 While the villa is undeniably luxurious, it is also very comfortable and welcoming. Built originally as the owner’s family holiday home, the villa caters for all age groups. If the novelty of relaxing by the two delightful swimming pools wears off, guests have access to a private tennis court, a games room with billiard table, table tennis and bicycles for exploring the surrounding rice fields and villages. 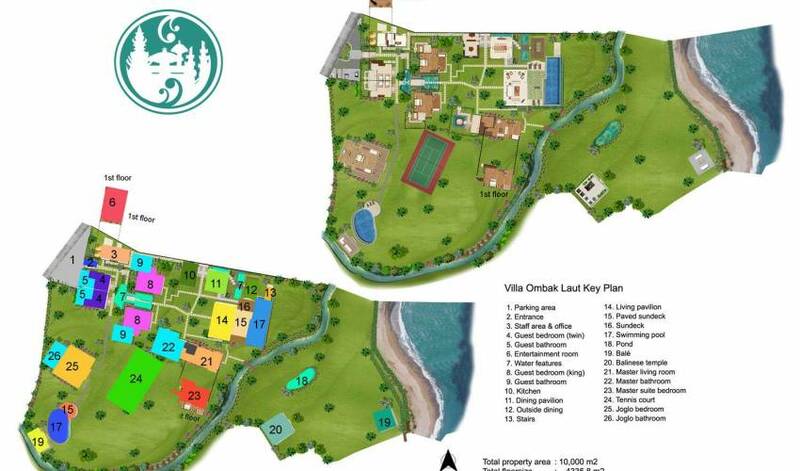 But what really sets this villa apart are its impressive grounds that sprawl across one hectare. Coconut palms sway in the breeze, fragrant frangipanis give off their sweet scent and manicured lawns roll all the way to the ocean. From the perfectly positioned sunset balé guests can see and breathe in the wild beauty of this dramatic coastline, and admire the mystical sea temple of Pura Gede Luhur Batungaus that lies just off shore. Completing the villa experience, Ombak Laut offers exceptional five-star service, with an experienced chef on hand to prepare anything from intimate romantic suppers to lavish dinner parties, and housekeepers and gardeners working tirelessly to keep the villa in immaculate condition. If guests do manage to tear themselves away from this magical oasis, a car and driver is on standby for trips further afield. 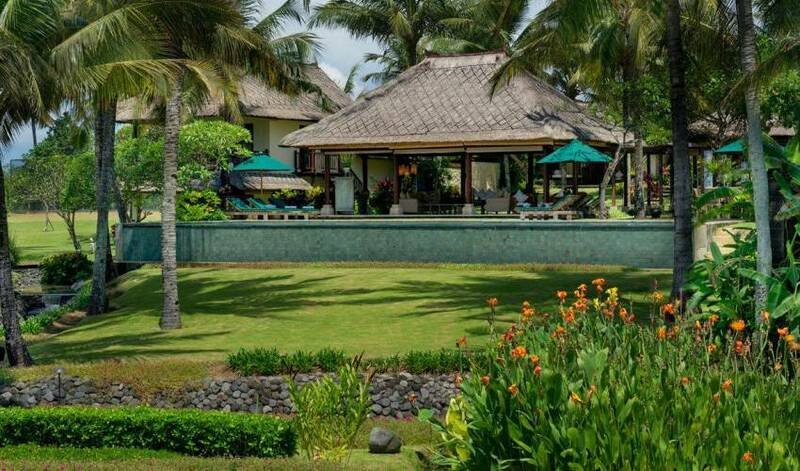 The villa is styled on the traditional Balinese compound, with peaceful and private sleeping and living pavilions resting amongst luscious tropical gardens. Guests enter the villa via wooden Balinese doors and a Palimanan stone staircase that leads to a trickling fish pond adorned with water lilies. From here the villa and its grounds are revealed, and the views go all the way to the ocean. To the rear of the property two guest bedrooms are housed below a large, bright, second floor games room. Two more bedroom pavilions lie on either side of a stepping-stone pathway that leads to the living pavilion which overlooks the 18-metre infinity pool, the garden, the beach and the ocean beyond. Adjacent to the living pavilion is a stylish dining room linked by a covered walkway to the kitchen. To the right of the living pavilion rests a two-storey building accommodating the master bedroom suite. On the far side of the grounds lies the tennis court, gladak guest house and second swimming pool with views to the nearby rice terraces. A sunset baléis strategically placed on rolling lawns, just above the beach for optimal ocean views. The traditional style open-sided living pavilion with its high-vaulted thatch roof is the social hub of the villa, cooled by ceiling fans and the fresh sea breeze. Two cream sofas and a deep daybed surround an antique coffee table, while two small tables and chairs provide the setting for a cup of tea. From here guests have uninterrupted views across the gardens and swimming pool to the ocean. Adjacent to the living area is the dining room with a solid teak table (seats 12) positioned under ceiling fans. Glass folding doors on all sides ensure the room can be fully enclosed in inclement weather and a brass gong sits in one corner to summon guests at meal times. The square kitchen sits behind the dining room and features black granite work tops, stainless steel appliances, a wine fridge and coffee machine. To the rear of the property, above the twin guest rooms, is the air-conditioned games room with glorious views of the neighbouring rice fields. Equipped with billiard table, 43-inch satellite TV with Bose CD/DVD player and iPod connection, soft English style sofas and a grand piano (not for guest use), this room provides respite from the heat and an escape for teenagers. Famed for its dramatic, absolute beachfront location, the villa spoils guests with an enormous amount of space. 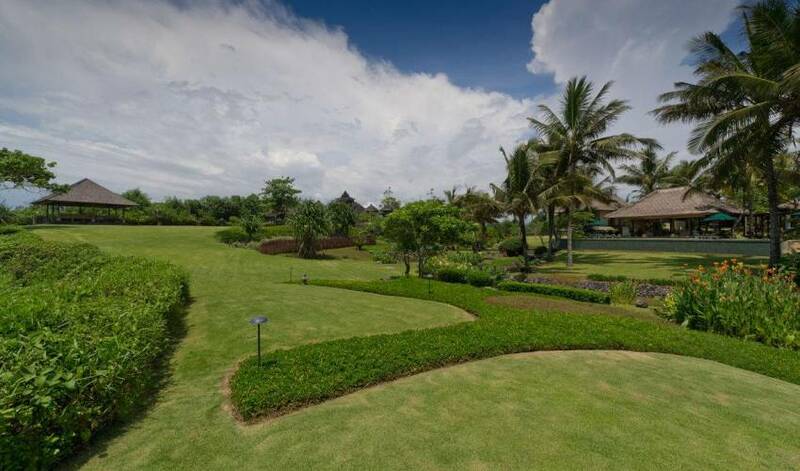 Beautifully landscaped, the gardens encircle the villa with their soft rolling lawns and vibrant green foliage. Pretty flowers inject splashes of colour and Javanese lamp boxes light up the surroundings at night. Carved limestone friezes and painted stone Sumba horses add to the villa’s unique ambiance. Just beyond the living pavilion is the 18-metre infinity pool, flanked by green sun loungers shaded by umbrellas and coconut palms and perfectly placed for relaxation. To the left of the pool, beside a lily pond, is an outdoor dining area (seats 10) – just the spot for a seafood barbecue. A bridge crosses a trickling stream and a stone pathway leads guests up to a large grassed area at the top of which is the sunset balé. Here guests can take in the power of the ocean as it crashes across the black rocks, glistening sands and holy sea temple. Opposite the gladak guest house is the well-maintained tennis court. After a match, guests can take a refreshing dip in the teardrop-shaped swimming pool and relax in the sun on one of the bright red loungers, or under the shade of the antique balé. Split over three levels, the master bedroom pavilion, with warm teak flooring, alang-alang thatched roof and stunning ocean views from its private balcony, is very romantic. The bedroom is located upstairs and features a super-king-size four-poster bed draped in mosquito netting. A wooden staircase leads down to a half-landing and the exotic master bathroom. Here, a large circular jacuzzi tub sits under a thatched roof within a garden courtyard. A twin terrazzo vanity and open-to-the-sky rain shower complete this spa-like ensuite. Below the bedroom is a cosy study with 27-inch TV, Bose sound system, piano, comfortable sofa and a library stocked with games, DVDs, CDs and books. The master bedroom pavilion is cooled with air-conditioning and ceiling fans. Behind the master bedroom and living/dining area lie two air-conditioned guest pavilions with thatched roofs, wooden floors and bright ceramic murals on one of their outer walls. Both rooms feature king-size four-poster beds with mosquito netting, ceiling fans, ensuite bathrooms with tubs and open-air showers. A small patio lies to the front of each room furnished with a daybed and wicker chairs. The two guest bedrooms located below the games room are ideal for children and/or grandparents. Light, airy and more modern in design than the other bedrooms, these two rooms feature cool terrazzo floors and bright abstract artworks and are furnished with twin beds (four-postered in one room). Glass sliding doors open to the garden, while semi-outdoor bathrooms offer a tub and open-air shower. Two trundle beds provide extra sleeping space for children in one of the rooms. The beautiful gladak guest house is perfect for guests craving some extra privacy. Facing the tennis court, this antique Javanese building has the feel of a tennis clubhouse, with prime views for watching a match while enjoying a refreshing glass of squash on the wide veranda: there’s even an old pressed wooden tennis racquet on one of the walls. Constructed entirely of wood, this air-conditioned, one-bedroom guest house presents a king-size four-poster bed draped in mosquito netting, delicate wall hangings, a daybed with trundle (sleeps two children), a comfortable sofa, desk and chairs. The rustic ensuite bathroom has a terrazzo bathtub and a rain shower enclosed by wooden panelling. Just beyond the gladak is a second swimming pool and relaxation balé. The villa is unrivalled when it comes to location. 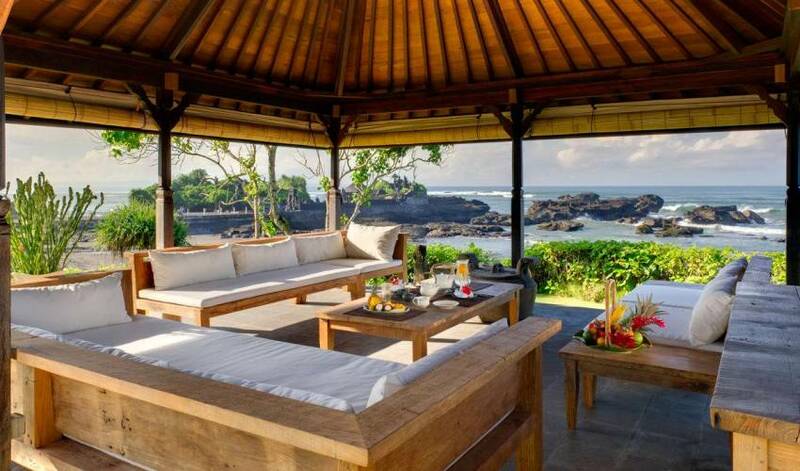 The villa is situated by Cemagi Beach, renowned for its black volcanic sands, craggy rocks and the mesmerising sea temple, Pura Gede Luhur Batungaus. Here guests are treated to incredible sunsets and views all the way to the Bukit Peninsula. The beach is great for daily walks and running but is not safe for swimming. Surfers need only go a few kilometres south for some of the best surf on the island.